Life is a creek jump in it! 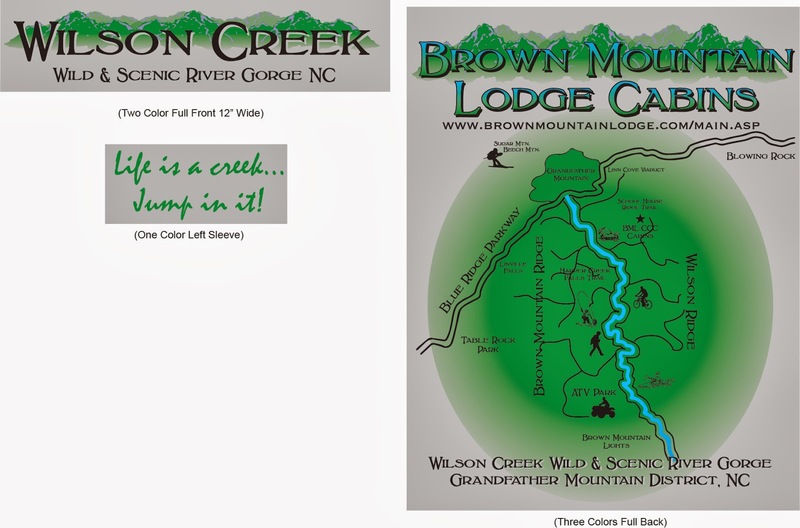 I've been working on making a cool quality T shirt to promote the Wilson Creek River Gorge and Brown Mountain Lodge Cabin Rentals. The art work is compete and shirts are ordered. Printing to start in 1 1/2 weeks. I went with Cool Comfort shirts which are the heavier weight soft cotton material higher quality in the pigmented stonewashed look colors. The basic colors are a denim blue, celery green, and a canyon brown, 70% ARE XL AND 30% L. The back is 3 colors front is 2 color and sleeve 1 color print. Wilson Creek Gorge is loved by the outdoor enthusiast in the region for kayaking, hiking, swimming, tubing, fishing, photography, Atv/UTV park, sight seekers, Brown Mountain Lights, and plain ole chillin in the hills by a camp fire spending quality time with family and friends. Folks the $30 just covers the cost quality shirts, the art design graphics, shipping and taxes, these are for the those of us that love the Wilson Creek River Gorge. Actual pictures of the art and shirts will be published soon as they come out of production. I'd Rather Be at Wilson's Creek!